In 1925 the state of Tennessee passed an Act forbidding the teaching of evolutionary theory, the law was tested when John Scopes from Dayton was put on trial. Clarence Darrow defended Scopes against a prosecution team led by William Jennings Bryan. The trial put religion and first amendment rights under the legal microscope but there was also an economic subtext to this cause celebre, Bryan was after all, the man who made the remarkable Cross of Gold speech in 1896. Regarding the Scopes trial, Bryan got it wrong, though his position was not without merit. Darwinism had been misappropriated and incorrectly applied at the turn of the twentieth century and used to undermine the position of US workers. Social conservatives at the time justified economic inequality on the grounds that it was a natural consequence of the `survival of the fittest`. This clashed with Bryan`s democratic outlook, while wrong he challenged science for the noblest of humanitarian/economic reasons, he remembered the poor and the downtrodden whose grievances he powerfully articulated in 1896. The same cannot be said today for corporate America, which is undermining scientific orthodoxy by spending vast sums of money, 120 million dollars channelled by a conservative billionaire, to cast doubt about the science behind climate change. According to Professor Chomsky contemporary American capitalism has morphed into RECD (really existing capitalist democracy) a voracious plutocracy. RECD (pronounced wrecked) Chomsky argues, is incompatible with democracy, leading to the marginalisation of the less well off, 70% of the population have no influence on policy and are effectively disenfranchised. In order to illustrate this point Chomsky has contrasted USA environmental policy with that of other developed nations. He points out that over a hundred countries have enacted legislation recognising the need for renewable power a list which excludes the USA. The lacuna in USA policy is remarkable because public opinion appears to support the scientific evidence regarding climate change. And that`s the problem for corporate America. It seems too many citizens are persuaded by the prevailing scientific orthodoxy, that humans are impacting adversely on the world’s climate and that the federal government should act. Professor Chomsky cites the work of Jon A. Krosnick and Bo MacInnis to illustrate widespread support throughout the USA in favour of environmental action, such as tax breaks for utilities that produce more energy from solar, sea or wind power. It was after all, the American public in the late 1970s that boycotted aerosol sprays, doing so in their millions and dramatically diminishing the market for ozone depleting goods in the process. Industry in the 1970s opposed progressive environmental measures but this didn’t stop Congress (responding to voter concerns as a healthy democracy should) including stringent measures in the 1977 Clean Air Act. How things have changed. The American public appear just as concerned about global warming today as their counterparts in the 1970 were about ecological issues but corporate dominance has taken hold of the US political system. The US public in the face of this plutocratic onslaught appear politically passive, a situation perhaps helped by the more recent corporate scheme of manipulating the education system. For Professor Chomsky the strategy is clear `Within the RECD system it is of extreme importance that we become the stupid nation, not misled by science and rationality, in the interests of the short-term gains of the masters of the economy and political system and damn the consequences`. Corporate interest, has led to a state legislature proposal called the Environmental Literacy Improvement Act. This has been proposed by the American Legislative Exchange Council, a lobby group which Chomsky explains is funded by the super rich to protect their interests. And the focus of this measure is US education or “balanced teaching” which is code for teaching climate-change denial, to “balance” the prevailing view on climate science. This measure camouflaged as an initiative designed to promote critical thinking, which also happens to serve the interest of the super rich. Legislation has already been introduced in several states; ALEC has plenty of clout because of the enormous corporate funding behind it. All very Orwellian and it’s interesting that while over a hundred nations are calling for more renewable sources of energy the countries actively campaigning for radical action and environmental safeguards are those which contain large indigenous, first nation populations – even where oil is the main commodity. President Hugo Chavez the Venezuelan President, who recently died, was lampooned by the media a few years ago when he made a speech attacking George Bush. However, his more measured substantive commentary, in the same speech suggesting limits on oil exploration were ignored by the US media. Indeed, it’s particularly revealing to compare the response of countries like Ecuador, with a significant indigenous population and massive oil reserves. This country is seeking aid from the richer nations to keep reserves in the ground, an approach recognising the environmental needs of the planet while in sympathy with the indigenous population. While Canada and the USA have it seems no such environmental concerns, burning fossil fuels including `Canadian tar sands, and to do so as quickly and fully as possible`. In the USA the environmental education/propaganda campaign has helped polarise the debate about climate change, even though a consensus exists among the scientific community on this issue. Professor Noam Chomsky is one of the most widely respected and sought after academics in the world; he is voicing concerns that need to be listened to. 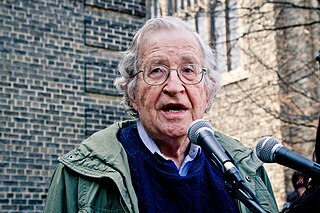 Chomsky is the canary in the coalmine he has sounded the alarm and we ignore his sound advice at our peril.